I'm not far away either I'm in Delaware. 2 of my friends got theirs already. I ordered mine right as registration started and still don't have my tracking number. And don't have my badge either despite living about a hour away from Baltimore. no Badge No tracking number ..
No badge or tracking number here either. Kind of frustrating honestly. But as long as it gets here before Day 0, I'll be okay. Well I guess that sort of explains it? Depending on where at in PA it would make sense. Contact us through the help desk (help.otakon.com,) but honestly I would give it until at least Monday. The holiday weekend probably threw off the mail a bit. The only Postal holiday last weekend was Sat. July 3 was a normal workday for them. You'd be surprised. I live outside DC and my parents live in Boston, normally it takes 2-3 days for mail to get there, but when a holiday is involved I've seen it take up to 10. I got my badge in the mail earlier on today, so I do know that they are coming. Mailman asked me to sign for something today and after getting my mail pile, my badge was in there. When I checked my member account last night, I hadn't gotten my tracking number. I had no way of telling when my badge was going to show up since my number wasn't posted so I'm very thankful I was still home when the mailman showed up. All I can say now is be on the lookout. Also I can also confirm that they are shipping the badges from Pennsylvania. For those worried, it's worth noting that shipping is super fast once it does ship. IIRC, my tracking number said it shipped I think the 6th, and I would have gotten mine today (in California) if I or the hubby had been home at the time. It's the 10th. No badge. No tracking number. Let's just call this whole "tracking number" experiment a huge failure. Why bother when people aren't even given the tracking number until AFTER they've received the badge? Are we now to assume that if we get a tracking number but haven't received the badge yet, that something horribly wrong has happened to the badge? 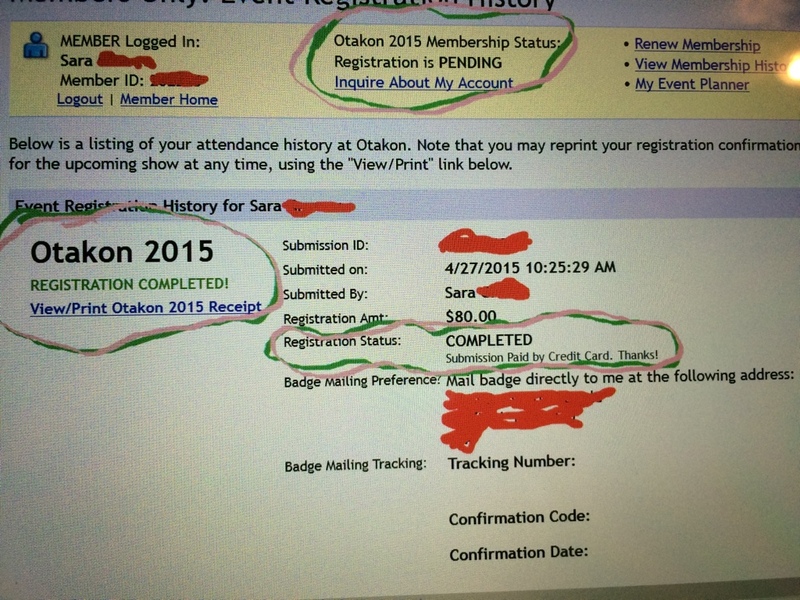 The holiday was six business days ago for the USPS AND the company Otakorp paid to get the badges out. Sorry, I can't accept that the USPS would still be in "holiday mode" a week later. I'm in Philly, PA and I just rec'd my notice from the post office, going after work to pick them up. I am in Phila too and I still have no tracking number. I don't know maybe it will be delivered today, although I won't be home to sign for it. I also think the July 4th Holiday excuse is ridiculous.I mailed something to a friend in Michigan through regular mail on July 3rd and she got it Monday. If the case is we have to sign for it, then I am out of luck. My mail man never gets out of the car or comes up if there is something I need to sign. Alright. Here's hoping I get my tracking # and/or badge today then. Question: I emailed the help desk about this, that my registration says both "PENDING" in the yellow box, and "complete" under the "event registration for______". I do have a space where the tracking numbers go, but could that play a roll in not getting my numbers and/or badge?? They told me they needed my full name, birth date, address and last 4 numbers of credit card I used so they can fix it, that was yesterday afternoon and it still hasn't been fixed, and I don't want my numbers to not be put up because of this mistake. Please help. For issues such as Pending Status, Inactive status, etc please submit a help desk ticket. This will allows to get information from you to look up your account and see what is going on. We will work as fast as we can too look at your account and fix any dependencies. I submitted a help desk ticket for the same issue and was basically given the polite equivalent of "I dunno lol." They did at least confirm that I am registered, but beyond that they apparently have no clue why the system is displaying like that. Hmmm.... I just don't want that guy to put up the last batch of numbers and have mine not show up cuz of this, or my badge not being mailed cuz of this. I had the same issue and talked to them. Got told i had 2 uncompleted registrations and 1 completed and paid for. Dunno how that happened but didn't seem to be a major problem and the girl said I should still get my badge in the mail cause she could see I was to be sent one. I still have no tracking number shown but I'm in hopes I get one soon. She did say if for some odd reason I didn't receive one to take my receipt and confirmation email with me and show them it and explain the issue. But that was the "if for some weird reason I didn't get my badge". I'm guessing I should get it then...but idk...I guess il see. For the love of anime and all that is good in this world! Finally!! Tracking number!! Just put up in like the last 10-15 mins. Wait... Is UPS shipping this cuz I put the tracking number they just gave me in the ups website and it says "Not Available"
I hope I get it in the next hour cuz I leave for work, or tomorrow. I did sign up for the text message alerts, so even if they do try to deliver it today while I'm at work, I will get an alert and know about it and if the guy decided to leave it without a signature or if I need to go to the post office and pick it up. WE HAVE TRACKING # SIGN!!! -sounds alarm bells and lights. Yes I have seen too much MST2K..
Just checked my member account and my tracking number is listed. According to the USPS tracking site, it shipped last night and is expected to arrive tomorrow.